Home » Articles » Illegitimate Government » What is a Soviet? In these increasingly divisive and stressful times, a need for the basic understanding of political systems has become crucial. At a young age I learned that a “soviet” was a system of interconnected councils that work to destroy individual personality, suppress individual potential, and centralize power into the hands of those who seek to control human action and human production. As a political science major and later as a law student, the definition of, or nature of a soviet social system was never addressed. But years later when “stakeholder consensus councils” began to swarm Santa Cruz County, I began to evaluate the subject in earnest. * A “Fire Safety Council” – created in order to impose a county wide Habitat Conservation Plan (HCP). The plan was designed by the Federal Department of the Interior and would have prevented rural landowners from reducing vegetation fuel loads on their land in the name of safety! * “Watershed Councils” – established for nearly every trickling watercourse in order to regulate human action from the stream bank to the upland ridge. * Special “action” neighborhood councils – designed to control home size, tree pruning or removal, colors and more for existing and prospective private homes. * A Federal ocean “sanctuary” – created to regulate and monitor the flow and use of all water between the mountain ridge and the seashore. Today, forest trees cannot be cut. The forest has become less healthy and more fire-prone. Farmers pay exorbitant taxes to draw water from their own wells. Commercial fishermen cannot fish the ocean. A ludicrous mass-transit system is being financed with federal and state money. Dense government housing is being built along the coastal rail line. Rules and regulation covering all manner of human activity are sprouting like forest mushrooms after rains. “Consensus” rules the day; Robert’s Rules of Order have been abandoned (or substituted with phony versions intended to fool people). Consistently each council is comprised of people (often the same ones) who are in agreement with a pre-arranged outcome. I know that the outcomes are pre-arranged because I attended many of these “stakeholder” meetings. My perspective always included addressing the consequence of the planned program on private property and individual autonomy. Without exception an attempt was made by the paid “facilitators” to disregard comments like mine. After realizing that a pattern existed within these councils, some of us learned how to expose the “change agents” objectives, despite being massively outnumbered by other people getting paid to attend the meetings. For instance, the HCP “consensus” was drawn from “stakeholders” including the Federal Department of the Interior, the Resource Conservation District, the State Department of Natural Resources, the County Planning Department, the Sierra Club, the Native Plant Society, Congressman Sam Farr’s Office, insurance industry representatives, the county Fire Chiefs, Non-Governmental Organizations (NGO’s), and local “environmental” activists. This council was defeated because the proponents could not stand up to the exposure of their irrationality by a small group of reasoned citizens. Why did so many people fight so hard to destroy citizen lifestyles at the risk of catastrophic fire in order to pursue a nonsensical land management policy? 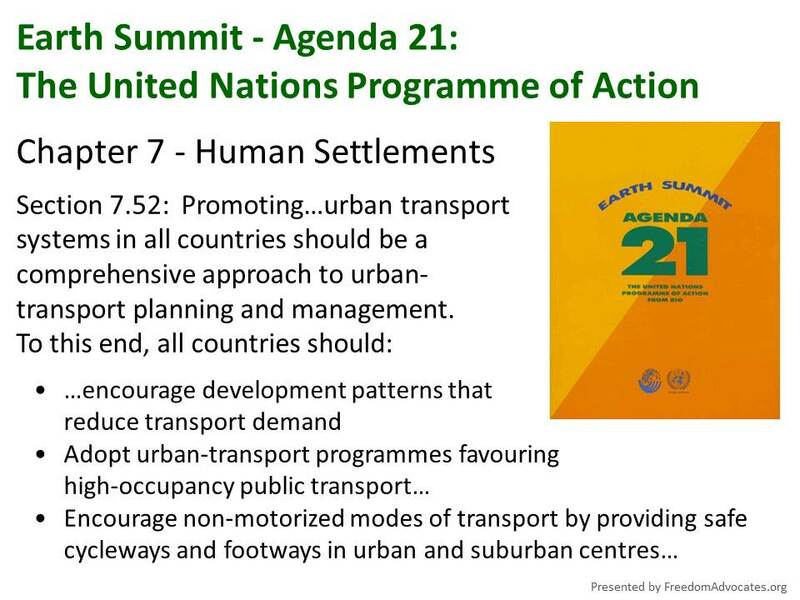 Agenda 21 is sweeping America under the nomenclature “Sustainable Development” using the environment as an ostensible front for the real purpose behind Sustainable Development Agenda 21 – implementing a partnership between business and government in order to seize America’s natural resources and to exercise increasing control over the American people. Soviets are the operating mechanism of a government-controlled economy, whether it be socialism or government-corporate (“public-private”) partnerships. Change agents are working with opportunists and other foolish people by coordinating government, business, NGO, and “non-profit” partners to implement a soviet system in your county, too.